Join our mailing list for the latest behind the scenes news, updates on RAD and special discounts! 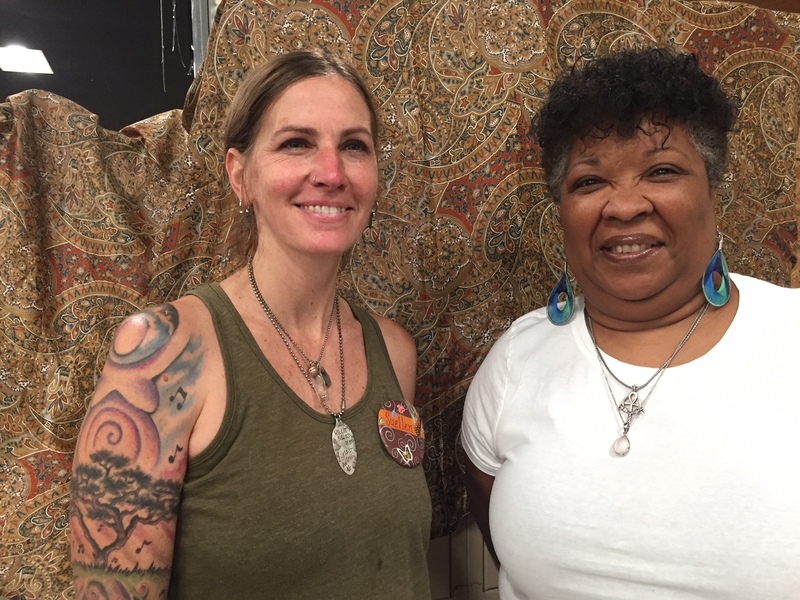 Terri Murray and Suellen Laberdia have been involved with fabrics for most of their lives, having started sewing their own clothes at a young age. Originally from Sacramento, CA, Terri has done it all. Before coming to North Carolina 17 months ago, she managed a Hancock’s Fabrics store, was a seamstress for costuming, theater, high-end department stores, and boutiques, and even costumed for Stevie Wonder. For more than 20 years Sue-Ellen has been making a wide variety of clothing, whether they were items to sell at festivals, outfits for belly dancers, custom wedding dresses, or her current focus, upcycling old cloth and clothing into unique pieces. Suellen is also new to Durham, she relocated from the Charlotte area 4 months ago. The customers aren’t the only ones who have noticed. Scrap Shop Manager Gary Owens says since the two started their team effort, the department has seen monthly increases of up to eleven percent, an impressive accomplishment. “We make sure that the customers can find their treasures at The Scrap without having to sift through everything,” says Sue-Ellen, who loves to get out on the floor and interact with the scrappers, where she is able to share ideas and learn from them as well. She also loves the way everyone works together, the flow of it all, which is not something she has found at many other jobs. June is shaping up to be a pivotal month for the Reuse Arts District (RAD). 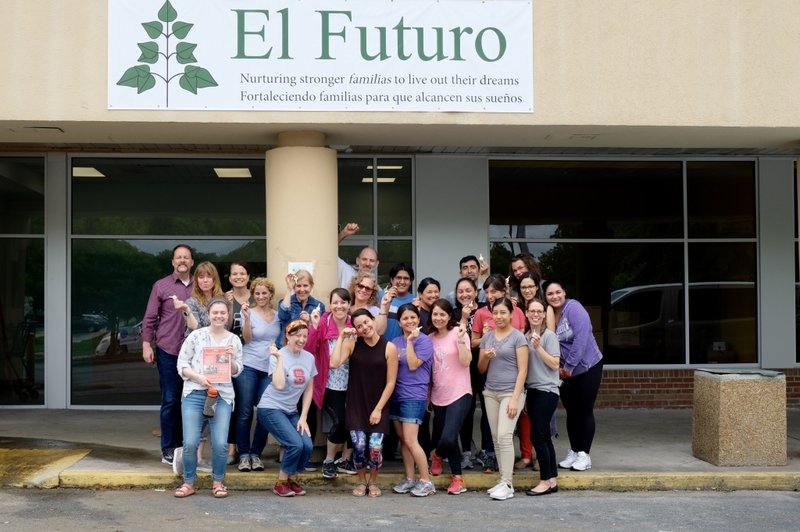 On May 31st, El Futuro moved into their newly renovated space in Suite 23. Days later, Catholic Charities of the Diocese of Raleigh signed a lease for their new Durham Community Food Bank to be located in Suite 30, the former DERC space. With the addition of these two organizations, The Scrap Exchange continues to create a buffer against gentrification by providing a mix of services, art, and retail for the surrounding neighborhood. PLUS … Just as this newsletter flies out to the world, another space has been leased! Victor Graham will be opening Rhythm’s Live, a new music venue in suites 33 & 34. Victor has set a target date of October 2018 for his new club. Needless to say we are thrilled by all the activity this month and it’s only mid June! Bring it on universe! 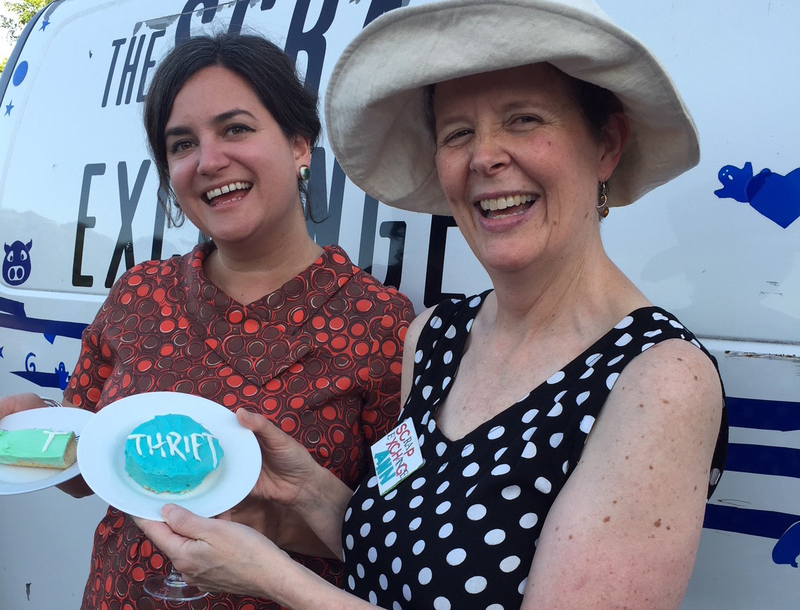 L-R: Board President Katy Clune and Development Director Ann Rebeck at a recent sign lighting ceremony thanking donors whose contributions financed the new signage at the Scrap Thrift store. Many Thanks to the Triangle Community Foundation! Since 1993 the Triangle Community Foundation (TCF) has been a supporter of the mission of The Scrap Exchange to promote creativity, environmental awareness and community through reuse. The TCF mission to inspire and mobilize giving, leadership, and action has allowed for The Scrap Exchange to grow into the national leader that we are today. Equity: Strive for equity and focus on people who are marginalized in our region, recognize the importance of addressing immediate needs and structural barriers. In the last several months we have embraced a capacity building initiative with the support of TCF. The Phase I organizational assessment allowed for us to learn about the changes we need to make to keep thriving. Phase II, if funded, will help establish a strategic plan. None of this visioning would have been possible without The Triangle Community Foundation.